This section of the site focus on "paid search". If you are interested in "organic search" and site optimization, check the Search Engine Optimization Resources, SEO Resources section of the site, which is specifically focusing on organic search and improving on ranking in the natural/organic SERPs (Search Engine Result Pages). If You Are New to Paid Search and search engine marketing, also called PPC advertising, then I recommend to you to read my article Introduction to Search Engine Marketing / PPC Advertising first. It provides a brief overview about what search engine marketing is and also a brief history of this young and still maturing industry. You might want to checkout the list of PPC search engines and services which include the big players Google, Yahoo! and MS Live, but also tons of the smaller 2nd tier engines and PPC services. Report: Over 650 Marketers and SEM Agency Execs Say What's Working in SEM. 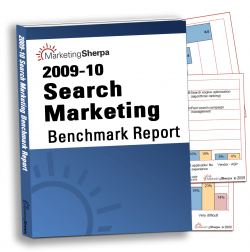 Read it in the fifth installment and all New 2009-10 Search Marketing Benchmark Guide by MarketingSherpa! Plus, you'll also see a new eyetracking heatmap revealing how consumers interact with Google search pages these days. MarketingSherpa is well respected for their Benchmark Guides, Buyers Guides and How-to Handbooks. Have a look for yourself at this free excerpt from this new benchmark guide and learn first hand how good the quality of this report is. Those Guides are for professionals and not cheap. To avoid that customers have to buy a pig in a poke, MarketingSherpa made a lot of their content available for free to the general public, at a special section on their Website created for visitors to roam freely in and absorbe knowledge. Long Tail Search - get an understanding of the "Long Tail" of Search. Microsoft AdLabs - Microsoft Advertising Laboratories - state-of-the-art research, breakthrough innovation, rapid prototyping to deliver smarter, more relevant advertising to the right people at the right time. Pandia Search Central resources to search engines, Internet searching and search engine marketing. The Future Business Model in performance-based Search Marketing? - a scientific article written by Andreas Reiffen as part of the Clicks2Customers Research Series. Paid Search Engine Relationship Matrix Poster and PDF, plus 10 addition SEM/PPC WhitePapers, including a complimentary copy of Search Engine Marketing Best Practices, written by Kevin Lee. All for free, if you sign-up for the Free Monthly SEM Email Newsletter by Do-It.com. PayPerClickAnalyst.com provides articles to pay-per-click advertising, reviews of PPCSEs, bid management and web analytics solutions and PPCSE tools. ClickEarns.com (nofollowed) provides a number of resources to Pay Per Click advertising, including articles that cover basic topics about paid search and ppc campaign management as well as recommendations for useful products, tools and services. If you want to conduct intensive keyword research for your paid search or SEO campaign, or if you are a webmaster who monetizes a website via contextual advertising like Google AdSense or Yahoo! Publisher Program, check the extensive Keyword Research Tools and Services at Cumbrowski.com. PPC Campaign tracking and optimization, campaign managment tools and other services and resources for paid search advertising. Do you need to conduct Competitive Research and Intelligence? Check the tools and services for PPC CI to see on what keywords your competitors are bidding on and how they rank in comparison to your own site. Performics 50™ Index (pdf) - Introducing Cost Per Keyword (CPK) - reflects overall marketplace search activity. benchmark to evaluate performance and effectiveness of your campaigns. 15 tips for AdWords beginners (PDF) - by Edit_g at WebmasterWorld, including comments by: eWhisper, Hissingsid, GuitarZan, Onlineleben, AndrewG, AdWordsAdvisor, ChrisGarett and Pmkpmk. 18 Pages Document.